This is the dental treatment we would provide for our mother-in-law. It is the best alternative to natural teeth! Involves placement of between 6-10 implants, also determined by bone volume and quality. 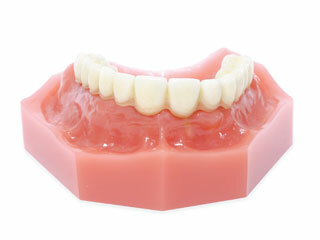 This is a fixed hybrid bridge removable by the dentist but not by the patient. 6-10 Mini Dental Implants. Hybrid Bridge removable by the dentist.